Hey there! 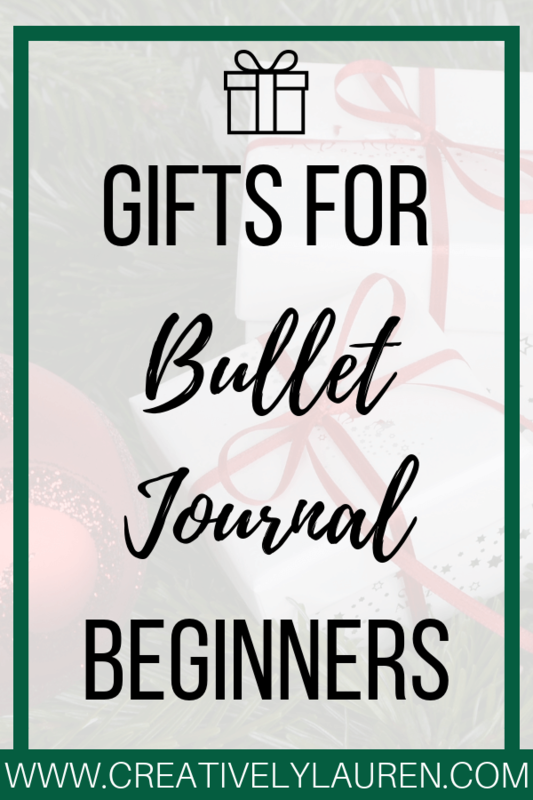 I’ve got another gift guide for you, this time for bullet journal beginners. Knowing where to start for bullet journaling can seem daunting, so I wanted to share a gift guide with perfect beginner tools. This post contains affiliate links, meaning I make a small commission off of each sale. If you would like to know more, visit our disclosure policy. Thank you for supporting Creatively Lauren. So, here is my gift guide for bullet journal beginners! Scribbles That Matter is a small business that sells mostly on Amazon, even though they have opened their own website. Their paperweight is 100gsm and has minimal ghosting and no bleeding. Their journal size is A5 and is perfect for a beginner. Many people love the STM journal, but some people have had issues with bad ghosting. This is the perfect tool for a beginner who is afraid of making mistakes. This helps make straight lines and circles and will help any novice make beautiful spreads. Tombow is a very well-known stationery brand. Their dual brush pens are some of the best on the market. They are expensive so I would definitely try to find a pack on sale on Amazon, or going to your local craft store and buy a single pen to test and see if you’ll like it. These brush markers are fresh on the market. Scribbles That Matter did admit that they are not created directly by them, but I do think that these are absolutely perfect for beginners. This pack comes with 60 dual brush pens, which is a great deal for beginners looking to get into brush lettering design but doesn’t want to spend too much. Leuchtturm is also well-known in the journal/stationery market. Their notebook is sized at A5 and their paperweight is 80gsm. Many people rave about Leuchtturm, but some people have also had claims of bad ghosting. These pens are great for bullet journaling. They are a fine point at 0.3mm and are perfect for making sharp and colorful lines/drawings. If you’re looking to get into bullet journaling, then this set would be good. This set comes with two brush pens, one with a hard tip and one with a soft tip. The hard tip allows for more stiffness to be able to learn how to control the pen. The soft tip offers more flexibility but is also harder to control. The soft tip pen would be more of an advanced pen. *Amazon considers this an add-on purchase. You must purchase $25+ to purchase this item. If you consider yourself artistically challenged and you’re too afraid of messing up your new journal, then stencils would be perfect for you. I even use stencils in my bullet journal. This stencil pack has everything you need, letters, numbers, headers, shapes, and more. Stencils are a great gift for beginners so they don’t have the fear of messing up their journal. These pens are great for making outlines on drawings or sharp and defined lines for bullet journal spreads. This set has a variety of weights ranging from ultra-fine point to medium point. These are good base spread pens, I wouldn’t use them for filling in your spreads, but for drawing them. Here are my bullet journal beginner gift suggestions! Wow I was thinking of getting a bullet journal this year and wouldn’t have even thought you could lok up if they bleed etc. Thanks for the suggestions and the share! Yes! I would suggest getting a dotted journal with at least 100gsm paper weight! You’re welcome! This is great—a gift guide and a beginner’s guide all at once. Thank you for sharing, Lauren!